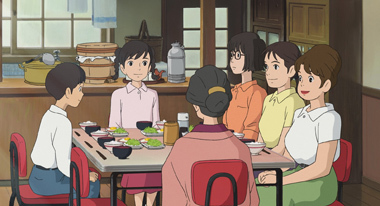 A new Studio Ghibli film is always a welcome sight. 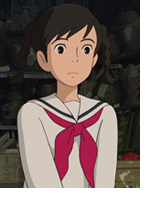 We return to Miyazaki again for another film, but not Hayao. 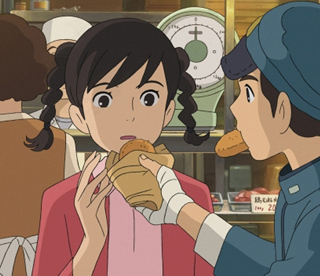 Instead, his son Goro Miyazaki has taken on another film, after poor reception of Tales of Earthsea, which is widely considered the "only bad Ghibli film." 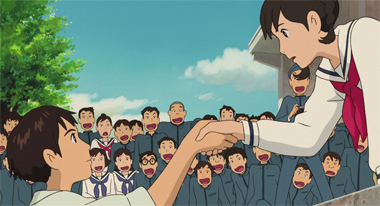 That's a bit of a dramatic take, but even so, many had tempered expectations leading into Goro's subsequent film called From Up on Poppy Hill - and we can happily report, your doubts are unfounded. 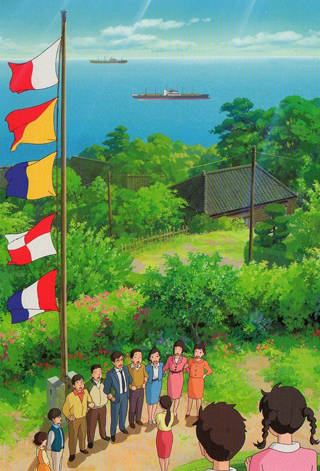 From Up on Poppy Hill is set in 1963, a tumultuous time in Japan's history. 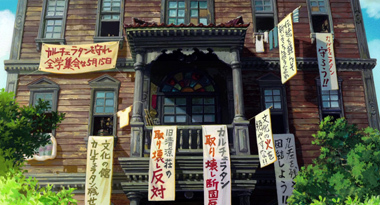 Still recovering from the effects of war and aiming towards the future as the 1964 Summer Olympics peered over the horizon, we find our two lead characters living in seaside Japan at Yokohama harbor. 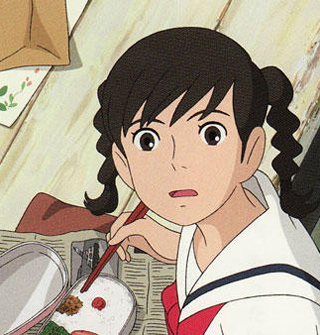 Umi, an independent and mature young girl who lives in a boarding house with her family, is our leading lady and an enjoyable character whose sensible behavior keeps everyone around her functioning. With her mother away and her father killed in the Korean War, she was forced to grow up quicker than other girls her age. Shun is confident, able, and well-respected in the school. 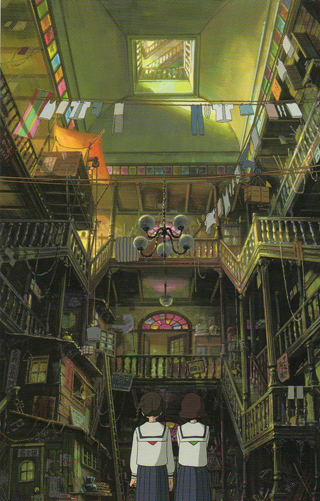 The Quarter Latin, a school building housing many of the clubs, is overrun and dominated by the boys. It's here that Shun and his friends create the increasingly popular school newspaper, which is where Umi first meets the charismatic editor. That is, after he jumps off the roof as part of his demonstration. The Quarter Latin, sadly, is due to be torn down and a new building put in its place. Given the boys' affinity for the aging, beautiful location, Shun begins campaigning to save the structure. He is well aware that the kids can do little against the school board's decisions, but believes dearly in protecting history and understanding it. 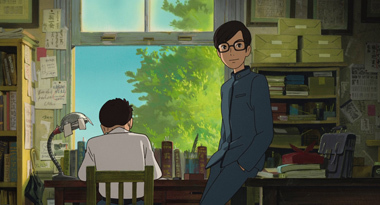 You can really hear Hayao Miyazaki pushing the pen into the paper in several scenes (he co-wrote the script), as his strong views on the value of the past shine through. Umi and Shun quickly become fast friends as they partner up in support of the building. A sudden development throws a wrench into their relationship, but Goro handles something that might otherwise be called "soap opera drama" deftly and with real emotion. The plight of the school intertwines nicely with Umi and Shun's development, despite a few minor pacing missteps. 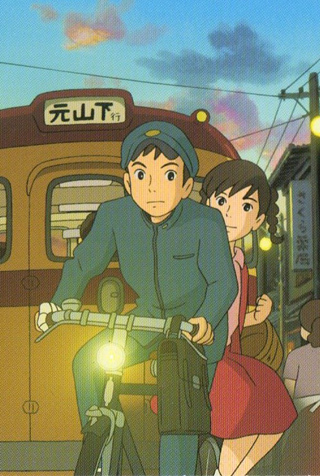 Animation and motion are central to Poppy Hill. 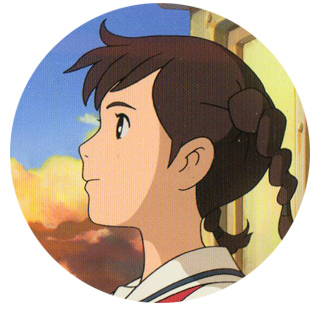 You can always expect to get beautiful artwork out of Studio Ghibli, and this film is no exception. Gorgeous foliage, a flowing bay, and all the liveliness of a bustling seaside town. 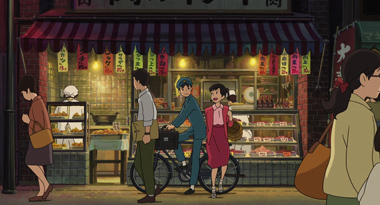 Characters are almost always in motion, and what viewers might call slow or "boring" scenes come alive due to the skills of Ghibli's animators. 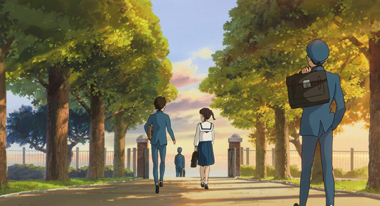 Simply put, even a mild, fantasy-less film like Poppy Hill is still one of the most beautiful films this year. 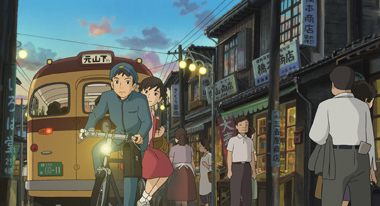 Despite his faltering first steps, Goro Miyazaki seems to have found his footing with Poppy Hill. 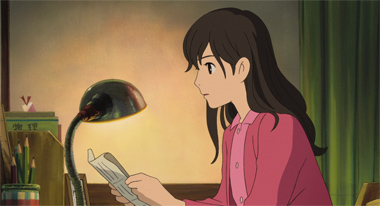 This film has more in common with Whispers of the Heart, a personal favorite of this reviewer, and the slightly quieter, more subdued tone lacks the Totoros or forest magic many might hope for. 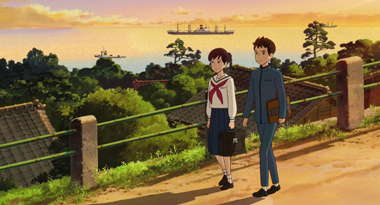 From Up on Poppy Hill is a simple love story, yes, but it's in that simplicity that it finds strength. The theme that history is something to cherish and learn from seems to fit Goro well, and he has made something much more entertaining and delightful as a result. 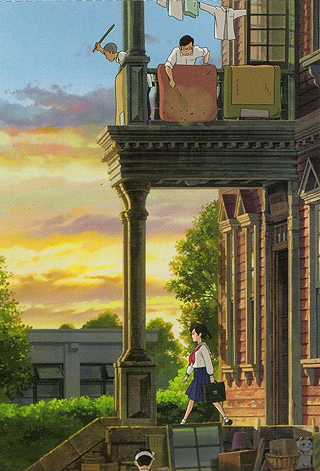 From Up on Poppy Hill feels homey, very much like a classic, and it has a spot on the shelf, right along with the rest of Ghibli's best. 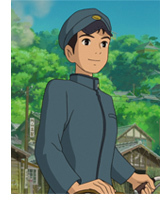 Below: Scenes from From Up On Poppy Hill. 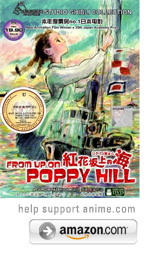 Below: Promotional illustrations for From Up On Poppy Hill.